I love finding things in old books---and I'm obsessive about keeping the finds exactly where I found them. When I was two years old, I received a Bible with gorgeous illustrations. As a child, I stuck special things into it over the course of my first nine or ten years. 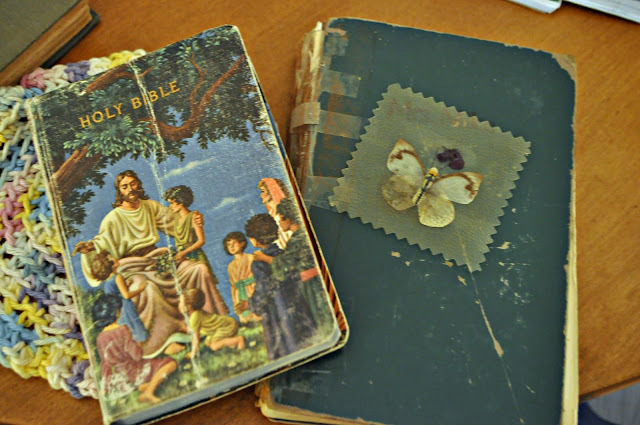 I was always really careful to keep all my little treasures in the same spot in that Bible---so careful that I had to get a second Bible to read because I was afraid of messing up my Bible-with-the-stuff-in-it. There's a pressed butterfly bookmark that was my grandma's, a letter from my Dad---I can't remember what all, but they're treasures! 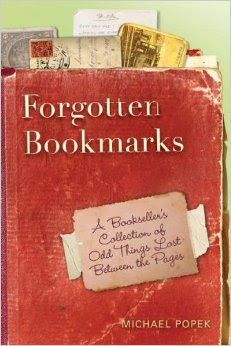 Author Michael Popek enjoys finding stuff in books, too. 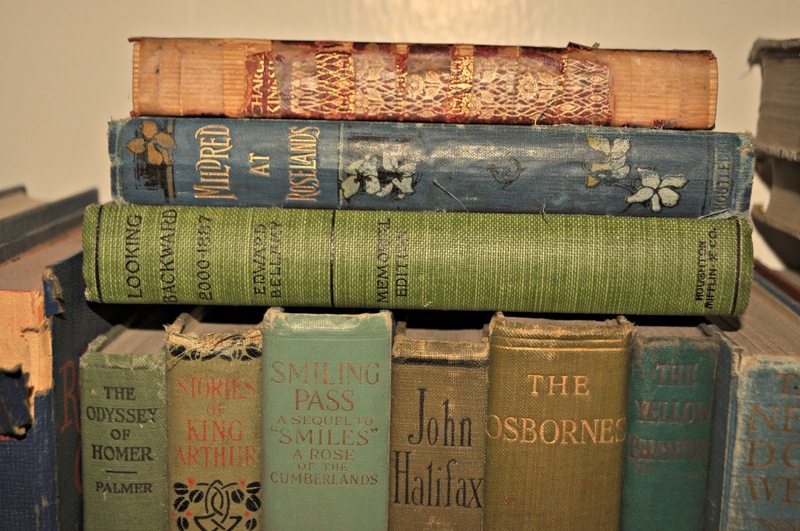 His family runs a bookshop in New York and he's been running a blog for the last 10 years, chronicling his finds. His books, Forgotten Bookmarks and Handwritten Recipes are full of interesting, odd, whimsical, and memorable ephemera---all things important enough for someone to keep but probably long forgotten. This was really a fun book. Now I want to go through all my old books looking for treasures! I think I'll make an effort to leave a little something behind in the books I pass on---just for fun. Who knows? Maybe the Garfield playing card I left in this one will show up in a publication someday. Some of my favorite finds of this book include a photo inscribed by Sara Teasdale's father, the very old letters from the late 18th and early 19th centuries, and the family temperance pledge from 1899. My mom, brother, and I signed a similar pledge around 1988 or so. 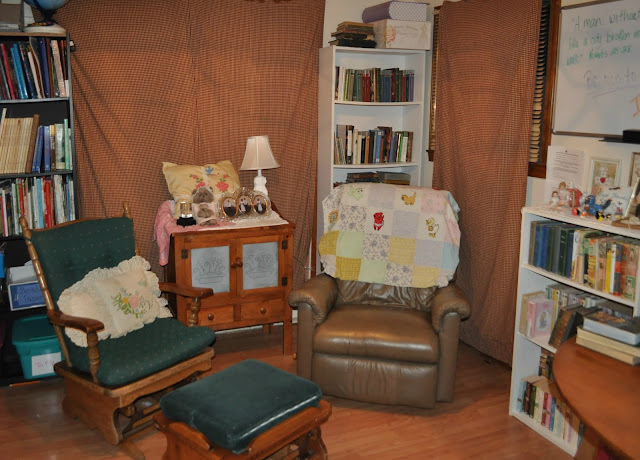 Which led me to wrangling my two oldest sons into moving a shelf into my sitting room and hunting around my books and crafts area in my bedroom for all my antique books. 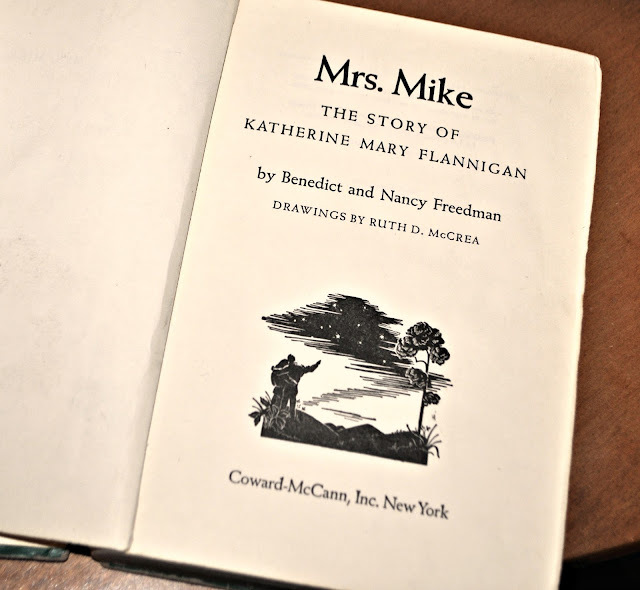 Which led to me seeing a ton of books I'd forgotten I had---like this 1947 first edition of Mrs. Mike that my mom gave me in the sixth grade because I had a crush on Mike Powell. After filling the spot behind the brown recliner with the bookshelf and books, I realized that this room has pretty much become a library. So that's what I'm calling it now---my library. But I'm gonna work on pronouncing it "lie-bree"...'cause it sounds so Miss Marple. I had forgotten about Mrs. Mike... I am so glad you still have it. I love your sitting room. Thanks for stopping by. I'm loving your blog and FB page. Thanks for the inspiration! My grandpa was a preacher and later a professor at BIOLA. Grandma did mission work with him in China where he preached and was a nurse. When they passed away there were plenty of Bibles to go around. I received one that Grandma had written family birth dates and places, wedding dates and places, etc. in. I still have all of her sermon notes where she left them and multiple bookmarks and greeting cards that happened to be in her Bible and it's case/cover. I was showing it to my aunt over the weekend. I treasure it dearly. What a treasure! I leave little notes and stuff all over the place, thinking that one day they'll encourage and inspire my descendants. My great grandma left a box of notebooks and Bibles full of notes and they sure do inspire me! My very first Bible was like the one with Jesus on it. I was young and didn't really get it. I think it had red words, and I knew they were magic. Your library looks cozy and comfy!